2) Cream the sugar and butter until smooth. 4) Pour half the batter into a greased 6 inch ramekin, then add the Nutella & chocolate chips. Spread the other half of the cookie dough & press some extra chocolate chips on top. 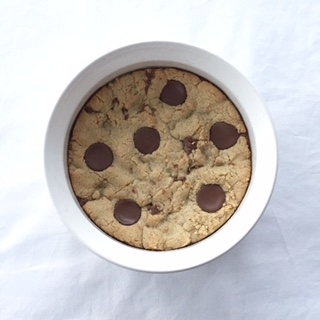 5) Bake the cookie pie for 10 minutes or until golden brown. Serve warm with ice cream. Enjoy!